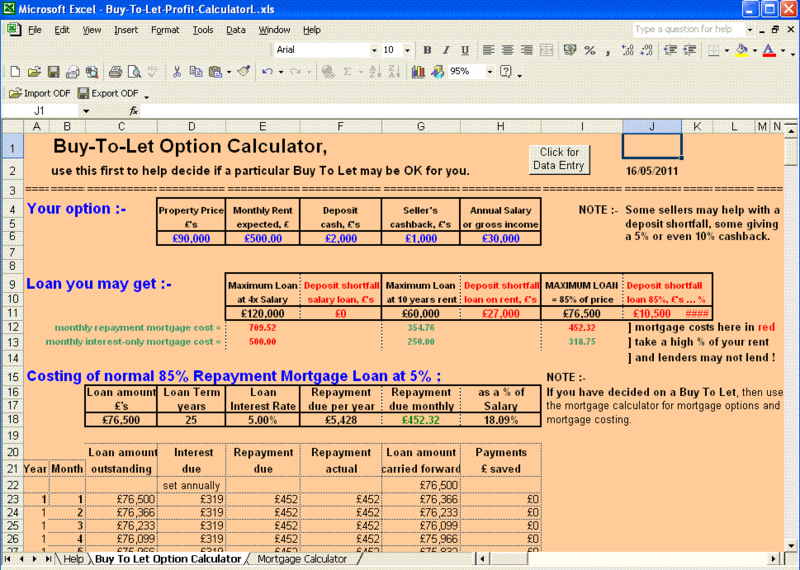 - Easy Excel Buy To Let Profit Calculator, with linked mortgage calculator. If you are thinking about a Buy To Let property investment, and have access to a computer with Microsoft Office Excel, then you could really benefit from our easy to use Buy To Let profit calculator. This Buy To Let calculator can help you decide if a particular Buy To Let purchase is OK for you. And the separate Excel commercial mortgage calculator also included free, can help you choose the best Buy To Let mortgage for you. Our easy automated Buy To Let Calculator in Excel is a MUST for anybody really concerned with doing a Buy To Let. Both included calculators, for initial appraisal and for mortgage costing, will help with your Buy To Let decisions. Our easy Buy To Let profit calculator will tell you how much loan you can raise and if it will be enough for your Buy To Let purchase. And our included Buy To Let mortgage calculator can calculate the cost of normal Buy To Let repayment mortgages as well as an Overpayment and/or basic Offset mortgage (linked only to a current account) - and what savings you could make by overpayment and/or current account linking as well as how much earlier they make the mortgage finish. Both of these calculators use easy input prompts, and onboard help. Use these easy automated Buy To Let Calculators to cost different Buy To Let options and their affordability. Suitable for all Excel versions from Excel97 onwards, and standard version can be downloaded when order completed. Get our easy automated Excel Buy To Let calculators now reduced to only £8.00. Order by clicking HERE. 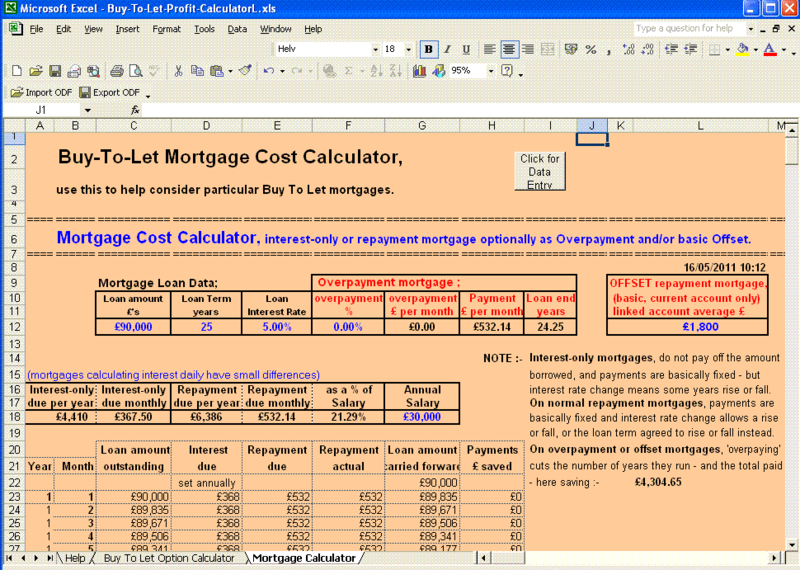 OR see our pair of automated Excel mortgage cost calculators now reduced to only £8.00. AND we do our own great Excel Shared Ownership Home Cost Calculator and SO Development Appraiser at good prices.